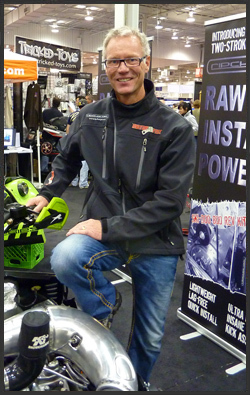 Ripcharger - The World's First Supercharger System For Two-Stroke Snowmobiles | Who Are We? Who are You? Russ Pocha lives in Kamloops, BC with his young family. He is a skilled tradesman with a passion for "Finding a better way." Russ has always taken a hands-on approach to whatever he does, making it a goal to learn everything there is to know about what he is undertaking and doing it himself. A true "Generalist," Russ has developed varied and numerous skills in carpentry, electrical, mechanics and machining. In his most recent stint as a successful homebuilder Russ has become proficient in a variety of disciplines, including home design, drafting, electrical design and installation, mechanical(HVAC) design and installation, plumbing design and installation, project management, preparation of proposals for estimates, rough and finish carpentry and landscaping. Russ is also a skilled automotive mechanic proficient in all aspects including electrical systems. 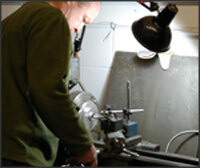 He's a detailed machinist and fabricator with a working knowledge of a variety of equipment and tools. Russ' intense curiosity and desire to make things better has led him to this latest project, "Ripcharger." 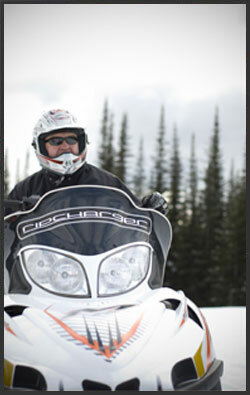 As an avid snowmobiler, Russ observed the never-ending desire snowmobilers had to go faster, farther, higher or simply to have the hottest sled. For over 3 years, Russ has been designing, developing and testing countless ways to overcome the challenges of "supercharging" a two-stroke snowmobile. Russ is excited to be at this critical point and is fully commited to to do whatever it takes to bring this revolutionary product to market. Dennis Smith is a 49 year old Businessman living in Kamloops, BC. With over 20 years of experience as a business owner. Dennis brings a variety of skills and experiences to the project. His skills in buying, negotiations, team building, marketing and finance along with a proven track record are instrumental in all stages of this exciting project. Dennis is committed to doing whatever it takes to assist in building a product and a brand that stand for quality, consistency, profitability and passion. Innovex is a boutique think tank and engineering consulting firm with venture and finance capabilities, specializing in engineering, product design, optimization and development, in addition to creation of new technology ventures. Innovex group offers an in-house test center to facilitate prototype fabrication, assembly and testing. Click on the Innovex logo to learn more. Casey Dundass, P.Eng MESc., is a founder of Innovex Engineering Corp. and provides significant expertise in product design, patents, licensing and financing. Prior to founding Innovex, Casey was COO with Traction Technologies Inc., an R&D company focused on product development in the transportation industry and winner of the BC New Ventures competition in 2005. 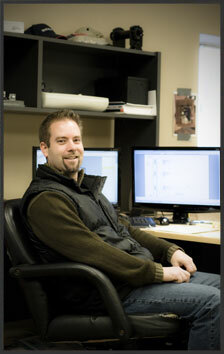 Casey holds a degree from the University of Waterloo and is a University of WEstern Ontario engineering graduate with over a decade of product commercialization experience. Casey's experience will add to the team's success in developing a solid platform to launch Ripcharger into the marketplace. See you on the mountain. Andrew Ross, P.Eng MESc., is a professional engineer with more than ten years of experience developing products and a background in mechanical design and manufacturing. He holds degrees from both the University of Waterloo's and the University of Western Ontario's engineering programs. He is a co-founder of Innovex Engineering group. Prior to founding Innovex, Andrew was VP of Engineering for Traction Technologies Inc.. As an entrepreneur, he has helped to build and assist clients with their companies to move past the development stage and into supplying marketable products. 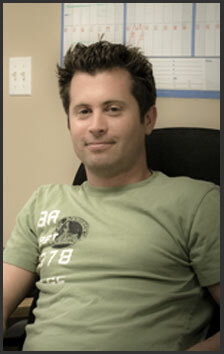 He is an asset to the Ripcharger design team and is excited to involved with this cutting edge technology.